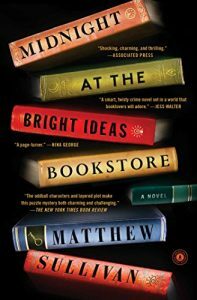 The Bright Ideas Bookstore is named for the former lightbulb factory in a slowly gentrifying section of Denver, Colorado, its founders have transformed into a sort of bibliophile’s fortress. It provides a quiet and contemplative environment for its patrons, rather like an old-fashioned library; comradeship in arcane interests for staff and users alike; and, literally, a defensive wall against the assaults of reality. I wish I liked this book more. I had bought it as a gift for my husband and grabbed it when my in-bed reading supply ran low. 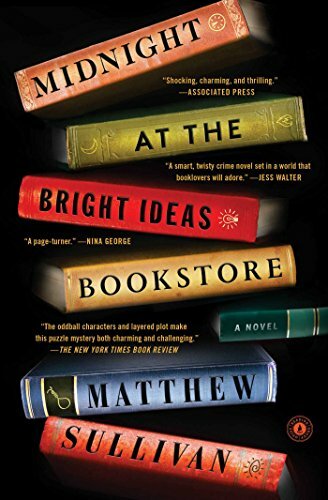 In “Midnight At The Bright Ideas Bookstore: A Novel,” (Simon &Schuster, 2017), Matthew Sullivan is simply too clever by half and I find it irritating. There is a coyness about the titles he invokes and the cultural history to which he alludes, as though he were sitting with fellow graduate students playing a game of literary Trivial Pursuit. On page 187, he provides a list of titles intended to evoke the spiritual bereftness of Lyle, the closest and perhaps only friend of Joey, whose suicide in the eponymous shop sets the stage: The Jew in the Lotus, Hindu Proverbs, Care of the Soul, Signs & Symbols in Christian Art, The Madonna of 115th Street, God: A Biography. Is this a test for readers to see if they recognize any of the books? I did. George Ferguson’s Signs & Symbols in Christian Art has been sitting on my reference shelf for years and is consulted regularly; I am, after all, an art historian. Other books that figure prominently in one or more of the mysteries explored in the story begin to sound like a checklist for the educated liberal who can remember any part of the twentieth century. I’m not particularly enthusiastic about the protagonist, Lydia, whose thoughts the author purports to know. I don’t like being “told” what a character is thinking or feeling in any case. I much prefer to imagine such things given what the character is doing or saying. Lydia’s inner life seems, if you will pardon the overused phrase “man-splained” the way that progressive men do in order to demonstrate empathy and insight into the female psyche, or that many do to lay out their credentials when it comes to people and cultures different from their own. The primary mystery focuses on the suicide of Joey Molina. Why did he do it? Who was he in any case? What is the symbolism and significance (“signs & symbols”?) of the books he cuts up and conjoins to leave coded messages that clearly he expects Lydia to discover and figure out—just as he hangs himself in the Bright Ideas bookstore at a time when he can ensure that Lydia will discover his body. A parallel mystery concerns a horrific murder that Lydia witnessed as a child. “Hammerman” bludgeoned to death a local family; Lydia was there by accident having planned a sleepover with the daughter Carol, an event that was moved at the last minute from Lydia’s home to Carol’s. Poor, poor Lydia. Needless to say, the stories intersect in complicated ways. There is a lot about Midnight At The Bright Ideas Bookstore that is original and entertaining. I think if Matthew Sullivan can rein in his impulse to strew so thickly both clues and red herrings—and suppress his compulsion to create a cast that includes every race, religion and ethnicity in the manner of “It’s A Small World (After All)”—there will be something for me to look forward to.